This is why the Deep State is fracturing: its narratives no longer align with the evidence. As this chart from Google Trends illustrates, interest in the Deep State has increased dramatically in 2017. The term/topic has clearly moved from the specialist realm to the mainstream. I've been writing about the Deep State, and specifically, the fractures in the Deep State, for years. Amusingly, now that "Progressives" have prostituted themselves to the Security Agencies and the Neocons/Neoliberals, they are busy denying the Deep State exists. For example, There is No Deep State (The New Yorker). In this risible view, there is no Deep State "conspiracy" (the media's favorite term of dismissal/ridicule), just a bunch of "good German" bureaucrats industriously doing the Empire's essential work of undermining democracies that happen not to prostrate themselves at the feet of the Empire, murdering various civilians via drone strikes, surveilling the U.S. populace, planting bugs in new iPhones, issuing fake news while denouncing anything that questions the dominant narratives as "fake news," arranging sweetheart deals with dictators and corporations, and so on. The New Yorker is right about one thing--the Deep State is not a "conspiracy:" it is a vast machine of control that is largely impervious to the views or demands of elected representatives or the American people. The key to understanding this social-political-economic control is to grasp that control of the narratives, expertise and authority is control of everything. Allow me to illustrate how this works. The typical politician has a busy daily schedule of speaking at the National Motherhood and Apple Pie Day celebration, listening to the "concerns" of important corporate constituents, attending a lunch campaign fundraiser, meeting with lobbyists and party committees, being briefed by senior staff, and so on. Senior administrators share similarly crowded schedules, minus the fundraising but adding budget meetings, reviewing employee complaints and multiple meetings with senior managers and working groups. 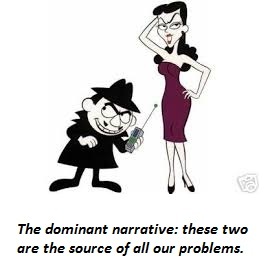 Narratives create an instant context that "makes sense" of various data points and events. Narratives distill causal factors into an explanatory story with an implicit teleology--because of this and that, the future will be thus and so. For example: because Iraq has weapons of mass destruction (WMD), the future promises the terrible likelihood (more than a possibility, given Iraqi deployment of poison gas in the Iraq-Iran War) that America or its allies will be devastated by Iraqi weapons of mass destruction. This teleology leads to the inescapable need to eliminate Iraq's weapons of mass destruction by any means necessary, and remove the political will to use them by removing Iraq's leader from power. Politicos and senior administrators rely on expertise and authority as the basis of deciding whether something is accurate and actionable. Professional specialists are assumed to have the highest available levels of expertise, and their position in institutions that embody the highest authority give their conclusions the additional weight of being authoritative. The experts' conclusion doesn't just carry the weight of expertise, it has been reviewed by senior officials of the institution, and so it also carries the weight of institutional authority. So when the C.I.A. briefing by its experts claims Iraq has WMD, and the briefing includes various threads of evidence that the institution declares definitive, who is a non-expert to challenge this conclusion and teleology? On what technical basis does the skeptic reject the expertise and authority of the institution? By gaining control of the narratives, evidence, curation and teleology, each node concentrates power. the power to edit out whatever bits contradict the dominant narrative is the source of power, for once the contradictory evidence is buried or expunged, it ceases to exist. For example, the contradictory evidence in the Pentagon Papers was buried by being declared Top Secret. The bureaucratic means to bury skeptical (i.e. heretical) views or evidence are many. Sending the authors to figurative Siberia is remarkably effective, as is burying the heretical claims in a veritable mountain of data that few if any will ever survey. Curation is a critical factor in maintaining control of the narrative and thus of control; the evidence is constantly curated to best support the chosen narrative which in turn supports the desired teleology, which then sets the agenda and the end-game. The senior apparatchiks of the old Soviet Union were masters of curation; when a Soviet leader fell from favor, he was literally excised from the picture--his image was erased from photos. This is how narratives are adjusted to better fit the evidence. Thus the accusation that "the Russians hacked our election" has been tabled because it simply doesn't align with any plausible evidence. That narrative has been replaced with variants, such as "the Russians hacked the Democratic National Committee." Now that this claim has also been shown to be false, new variants are popping up weekly, with equally poor alignment with evidence. The primary claim of each Deep State node is that its expertise and authority cannot be questioned. In other words, while the dominant narrative can be questioned (but only cursorily, of course), the expertise and authority of the institutional node cannot be questioned. This is why the Deep State is fracturing: the expertise and authority of its nodes are delaminating because its narratives no longer align with the evidence. If various Security Agencies sign off on the narrative that "Russia hacked our election" (a nonsense claim from the start, given the absurd imprecision of the "hacking"--hacking into what? Voting machines? Electoral tallies? ), and that narrative is evidence-free and fact-free, i.e. false, then the expertise and authority of those agencies comes into legitimate question. Once the legitimacy of the expertise and authority is questioned, control of the narrative is imperiled. The control of the narrative is control of the teleology, the agenda and the end-game--in other words, everything. If the institution loses control of the dominant narrative, it loses its hold on power. This is why the Deep State is in turmoil--its narratives no longer make sense, or are in direct conflict with other nodes' narratives or have been delegitimized by widening gaps between "definitive" claims and actual evidence. There is indeed a Deep State, but its control of dominant narratives, and thus its source of control and power, is crumbling. The gap between the narratives and the evidence that supports them has widened to the point of collapse. Thank you, David K. ($250), for your beyond outrageously generous contribution to this site -- I am greatly honored by your steadfast support and readership. Thank you, Brendan M. ($50), for your wondrously generous subscription to this site -- I am greatly honored by your steadfast support and readership.